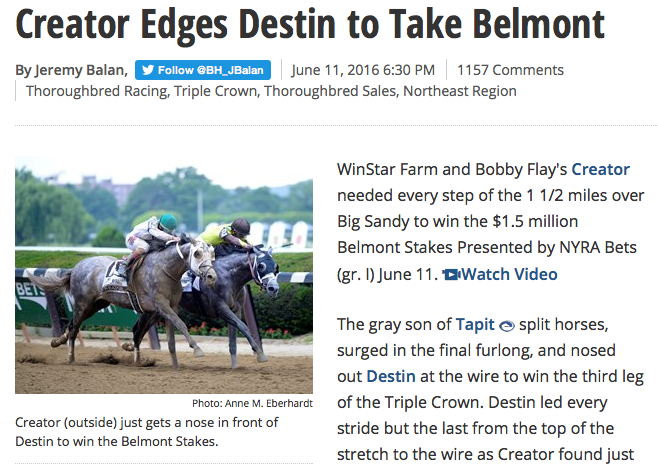 When Creator won this weekend’s Grade I Belmont Stakes, it was a fantastic win too for breeder’s Mt. Brilliant Farm. Here’s what Marette had to say about the fine achievement: “It was a magical day for Greg Goodman’s Mt. Brilliant Farm, along with their partner Orrin Ingram. No one loves the business more then Greg Goodman and his son Hutton, so it is a vindication for their commitment to breeding top class racehorses from a small boutique band of broodmares.